Microsoft’s search engine Bing is always playing second fiddle but it has some cool features absent in Google What Do Bing And Yahoo Have That Google Doesn't? What Do Bing And Yahoo Have That Google Doesn't? While Google has everything that you might need, it has its shortcomings when pitted against some of the features Bing and Yahoo! have. Google isn't perfect, and I'm here to tell you why. Read More . 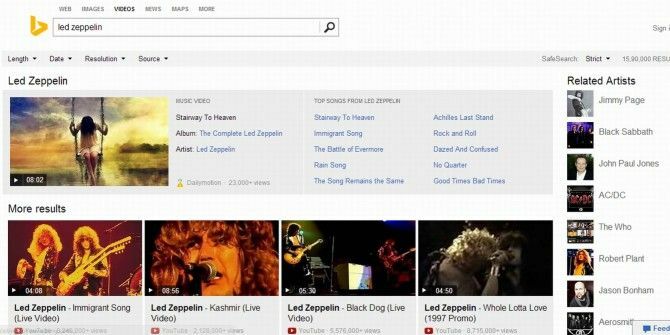 And the new Music Video Search—activated through the regular video search in Bing—seems like yet another such tool that outclasses its rivals. “Whether you’re looking for videos of songs and artists you are already familiar with (like Led Zeppelin and Justin Timberlake) or you’re looking to discover the next-up-and-coming artist or revisiting the classics, we’ve got you covered,” Microsoft wrote in a blog post. Searching for any artist or song results in the most popular video being showcased in the top-left. The videos are sourced from many sites, including YouTube, Vimeo, MTV, Artist Direct and more, spanning 1.7 million songs, 70,000 artists and a half a million albums. Users can hover the mouse over the thumbnail to get a preview of the video, including sound, and can click for the full version. Discovering new songs is a big feature in the new service. Using the connections between artists, songs, albums and genres, Bing smartly generates a “Top Songs” section of relevant and popular music videos, shown at the right of the showcase. Like in YouTube, you will get a longer list of relevant videos further to the right. But because it uses many services, the result is more powerful than YouTube Music YouTube Music: Easily Discover New Music Videos on YouTube YouTube Music: Easily Discover New Music Videos on YouTube Read More . Perhaps the coolest feature of the new Bing Music Video Search is that it doesn’t only give you “singles” and also focuses on “albums”. Pink Floyd’s The Dark Side Of The Moon, for example, is an album meant to be heard in its entirety and in sequence, so if you were to search for a song from it, Bing will also give you an ‘Album’ mode to listen to the full album in the right order. The new Music Video Search seems quite cool and our brief experience has been only positive so far. This would definitely fall into what we once termed “Greater than Google: The best bits of Bing Greater Than Google: The Best Bits Of Bing Greater Than Google: The Best Bits Of Bing When we think of searching the Internet, we without a doubt think “Google”. And why not? It’s a fantastic search engine and has some great features. But even before the idea of writing this article,... Read More .” Give it a whirl and tell us what you think in the comments. It seems like great! I always download YouTube music videos and convert them to .mp3 files with aneesoft youtube converter.